Each stop will not only get you ready for the release, but have a chance to win one of Some Odd Girls new sets! That is 7 chances to win! 7! Kristy is THAT excited about this release that she is going all out! To be eligible to win you must leave a comment answering the Odd Girls’ questions at each stop before the end of the day March 18th (midnight EST). Spring is in the air and its blown into Oddland! 3 New Stamp sets to bring in the season with lots of fun stamps on each set that will take you into Spring and beyond with this newest Spring Clear Stamp Release!! All three sets are delightful. They scream spring, and picnics in the forest, and woodland cuties. They are my favorite stamps to date!!! I have mixed two different clear stamp sets on here from Hey Kaylee and Gwen! Aren't the mushrooms and critters sweet? The snail is my absolute favorite.. something about that happy little face makes me smile! For that reason, I am giving away the brand new release Hey Kaylee!! Big thanks to Kristy for her generosity!!! There you have it my friends... please leave a comment on my blog, consider becoming a new follower if you aren't already, and... tell me your favorite thing about Spring!! One lucky person will be selected to win the Hey Kaylee set! You have until Sunday March 18th at midnight EST to comment. :) Lucky winners will be announced Monday morning during the reveal!! Next on the blog hop is---->>> Fluffy Faye!! Leah this tag is so cool! I love the wee critters! Hhhmmmm... my favourite thing about Spring is the lushness of the scenery about and all the pretty flowers blooming. Very cute tag! My favourite thing about Spring is hearing all the birds singing. That sound really makes me think of Spring. Leah!! This is so beautiful!! Love the woodland theme and the colors you've chosen are FABULOUS together!! awww Leah this is so darn cute...I am so loving the theme...I love all those mushrooms...what a fun fun tag..
Great card, love the bright springy colors! My favorite thing about spring, is waking up to the birds chirping! Oh my gosh even more cute cheeks I want to pinch and love to bits! I know you may see this coming but my favorite part of spring is the new baby animals. We have tons of ducks in the area and each spring we see the mates come back and then eventually the little ones...SO cute! So sorry Leah, I don't know about spring because in Indonesia just has two seasons, the dry and the rainy seasons. Leah - your tag is SUPER cute! I love the mushrooms you've added and the fun colors too! Gorgeous job! Gorgeous tag - love all the bright colours. My favourite thing about Spring are the longer days and warmer weather + all the gorgeous Spring flowers that are starting to appear. Love your tag...and I agree, the snail is supercute! I loooove spring...I´m a spring-person! The sun, to wear my Converse without woolsocks, see everything come to life, the green...the flowers...I love tulips! Wonderful tag!! So fun :-). And I love spring flowers. Don't see enough of that in AZ! So stinking cute! My favorite thing about spring is all the new beginnings of life; calfskin, lambs, new green grass, flowers on the trees blooming etc... So colorful! I love the bunny. My favorite thing about Spring? My birthday is March 21, so I'm a spring baby. Tell me your favorite thing about Spring!! The beautiful weather and the flowers is my favorite part. Such a gorgeous card! My favorite thing about spring is the fact that the flowers are blooming and there's lots of little animals around that are just born! My very favorite thing about spring is that the sun is starting to always shine and the flowers are blooming!! What an adorable tag! Full of lots of sweetness! My favorite thing about spring is all the new life..new buds on trees, new flower shoots, new baby critters...you can't help but smile and be in awe of it all! Ooh Leah, these are fab!! Soooo cute and so much fun for Copics, LOVE!!! awesome Spring card! Just love the mushrooms and adorable critters!!! My Favourite thing about spring is simply flowers, such a sucker for pretty colours! Awesome tag. Love those mushrooms. My favorite thing about spring are the green grass and flowers which start to bloom. Such a cute tag!! I love the sunshine that spring brings. I'm. A new follower! Delightful, I love this honey! My favourite thing about Spring is not having our gloomy British weather with the sweet birds waking me up! My favourite thing about spring? Hm... that winter is over? LOL! What a gorgeous tag, so adorable. Love the way you put the whole thing together! Super sweet tag! My favorite thing about spring in AZ is the gorgeous weather (perfect convertible weather), the wild flowers and the smell of the blooming citrus trees! Yeah! It's so original!!! Love it! I love all the flowers and colors that come with the spring!!! Everything looks great! soooo love this tag!!! very adorable! love all the critters you used on it!! My fave about spring is to leave the Ol Yucky Man Winter behind!!!!!!!!!! Your tag is so adorable. My favorite thing about spring is warmer weather. ohmy...this is so adorable! love it!!!! Your tag is so pretty! I love the toadstools and all the cute critters! My favorite part of spring is the flowers, I love all the fun colors that start blooming. It's so refreshing. My favorite thing about spring is the warmer weather and the bluebonnets and other wildflowers that pop up everywhere. It gives the whole area a splash of color. lovely! I love that lil snail as well. This is soooooooo cute cute cute!! I loveeeeeeeeee the colors and those little critters! This is a fantastic tag girl. Expert color job. It's so freaking CUTE! Oh wow Leah! You have blown me away yet again! I love spring! Here in Texas we don't have a lot of weather that is nice and cool. But the one month of spring that we do have the weather is perfect!!! Love your darling card. My favorite part of spring is the freshness in the air, opening the windows after the cold, wet winter is a favorite of mine!! Your card is very SPRING and colorful! Ohhh my favorite thing about Spring is the first lawn mowing of the year and the sound of CHILDREN playing. OH how adorable! I love this tag .. so cute and clever. Your colouring is fabulous. My favourite thing about spring ... being able to have the window open when I'm crafting ... the cool breeze and fresh air give me more inspiration. How absolutely adorable! Love the mushrooms! What I love is the fresh green colours of the new leaves on the trees. I love all shades of green, but those greens are my favourite. Super cute! I love the Warmer weather, blooming flowers, and my birthday is in Spring!!!! Leah...your card color palette(the red, brown and gold tone) totally make me think of my living room. Jut like Rinne said it make me feel all warm on this rainy day in OC CA. Beautiful colors! Gorgeous card! Love your colors. That's what I like about spring, the colors, they are so vibrant and fresh. Hi Leah, Gorgeous card! Love the cute images. What I like about Spring is seeing all the pretty Spring flowers (snowdrops, daffodils, crocuses). What an adorable tag!! My favorite thing about Spring is having good hair days EVERY DAY!! lol. what a cute tag.... love it. i love the card! perfect. i just love spring when all the parrots babies are about and they come in to my garden and eat off my seed tray. they are never shy when they are little and you can get real close. Love your card! Love how you did the animals. What I love About spring is that it tells me.that winter has gone and great weather is coming. Also birds chirping outside my window makes me wanna go and sing with the kids. The one thing I love about spring is all the flowers that start to come out in bloom. It just makes me think that nature is being renewed and that everything is coming to life. Plus seeing my garden in bloom just makes me smile while I have my coffee in the morning. Oh my, just ONE favorite thing about spring? There are so many wonderful things about this season as we transition from the cold, darkness of winter into the bright, colorful season known as spring. OK, so just one, eh? Then it would be watching the earth come awake from winter hibernation -- the birds twittering, the flowers peeking through the soil, the squirrels and birds building their new nests -- the wonderful activity of awakening. Spring is the time of year all natuer is waking up. Love the smell of flower and thw sight is amazing. I agree with you: not hard to fall in love with the critters!! My favourite thing about Spring is - the kids actually go outside to play!! lol. Oh what a beauty! These new stamps are just adorable!! My favorite thing about spring? Flowers, warm breezes, green grass, birds singing... :) There's so much to love about spring! This tag is fabulous! The critters & your coloring are amazing!! My favorite thing about spring is the sunshine (&rain) and Spring Vacation. I love the wee snail too! So cute! My favourite thing about spring, is watching the buds on the trees and bushes get bigger and bigger and then they eventually explode with colour! I love it! My fave thing about spring is the very special smell, the air seems to get, and then looking at all the small flowers coming up to say hello to the world. Isn't that just amazing ??? Your tag is so cute, Leah! You do fantastic shading!! 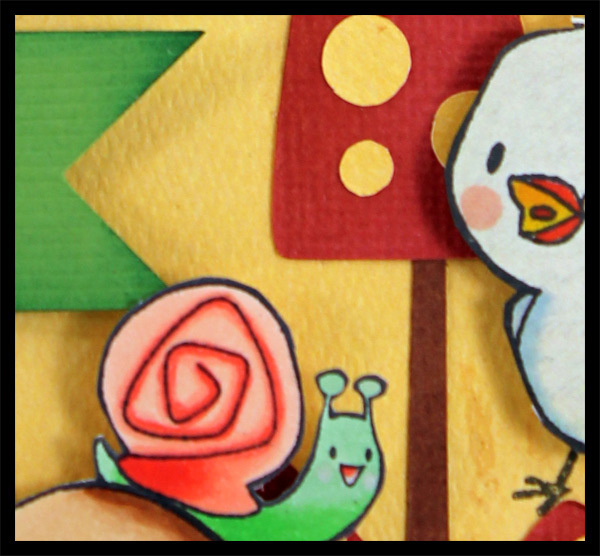 I love that little snail too, such cute stamps. I guess my fav thing about spring would have to be the start of softball season! WOOOHOOOO!!! EEEK! Love the forest of mushes! What a super tag Leah! It looks fabby!!! OH WOW this is bloomin' gorjuss!! Fantastic colors and feel of spring! Which reminds me.....my fave thing about spring is the smell! For sure! Thanks for sharing your great tag! 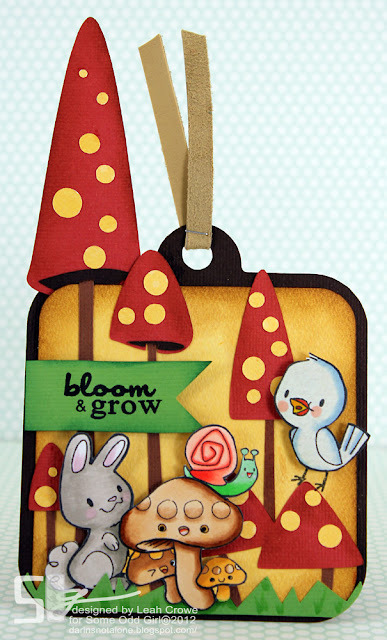 Oooh Love how you have used just the little critters, it looks fabulous! Well my fav thing about spring is finally being able to get out of the house and go for some picnics with the hubby and kids! Thanks for the chance to win! What an adorable card! These little animals are just too cute! My favorite thing about spring is the renewal of all earth's life. I love the flowers, birds, and all the smells and noises of spring.